The cenotaph in front of the Federal Building, the altar table standing in St. Ninian's Cathedral, the vestry behind it, the archway heralding Columbus Field, a cairn immortalizing the Chisholm Clan, Gilmora Hall - these and countless other monuments pay tribute to over 78 years of craftsmanship emanating from a small enterprise at North Grant. In its 78th year of Arsenault Monumental Works and its proprietors, Joe and Phil Arsenault, have every reason to celebrate for they represent a proud history of an ancient craft. 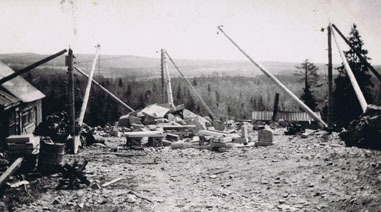 The business began in 1936 when Wilfred "Papa" Arsenault first tapped in the quarry in North Grant. It had been used some 70 years before to provide stone for the cathedral, but by '36 was completely overgrown with shrubbery. 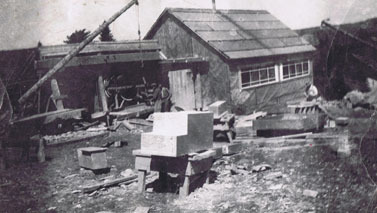 The year the ambitious craftsman received his first order - a cenotaph to be erected on Remembrance Day, 1936. Not without some difficulties, Wilfred made the deadline and his business was underway. 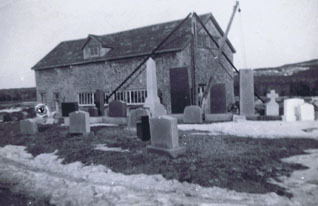 The following year Arsenault Monumental Works built the vestry to St. Ninian's Cathedral and in '38 it employed 65 men to build Gilmora Hall at Mount St. Bernard. the project took only one year. In those early years stone cutting and masonry were rudimentary. There were no dozers to clear the quarry land. A hammer and chisel were basically the tools of the trade. In time, however, Wilfred introduces advancements to the operation. After one year in business he had stream power to operate the derricks which maneuvered the large slabs of stone. Gas generated a large gang saw with blades requiring frequent replacement. 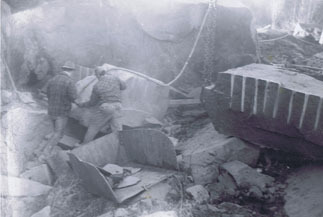 In 1950, the Arsenaults had a large stone planer. Despite these concessions to modern science, it was difficult work. For example, it took an entire day to lift the altar table earmarked for St. Ninian's Cathedral from the North Grant quarry. The solid piece of stone was plucked by a derrick manned by two labourers. That same stone had to be polished by hand. In the early years, Andrew MacDonald delivered the finished product for Arsenaults in a Model A truck for $.50 a load. Despite the introduction of electrically-powered air chisels, sophisticated cranes, and a larger-than-life wire saw, some aspects of the craft have remained unchanged. 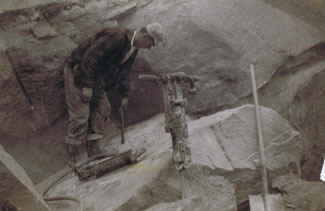 "Plugs and Feathers", for example, is, after 50 years, still and effective method of removing granite from the rock face. When using this method, holes are drilled into the rock face. When using this method, holes are drilled into the rock in a straight line. Feathers or liners are placed in the holes and plugs, long steel pins, are hammered into the holes. In time the rock breaks away in a straight line. When this method was first used by Arsenaults, the drilling was done by hand with two men swinging sledge hammers and a third turning the drill every time the hammer hit. Today water is frequently used to carry an abrasive material over the surface of the stone. The process advances the cutting or polished process, depending on the type and amount of abrasive. 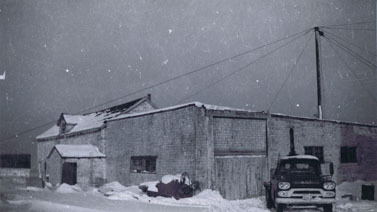 In the early days of "Papa" Arsenault's business, water was extracted from a nearby spring but today a reservoir stands next to the shop. At times two blacksmiths were employed full-time to maintain a sharp edge on the many blades used in the operation. Work was long and hard for everyone. 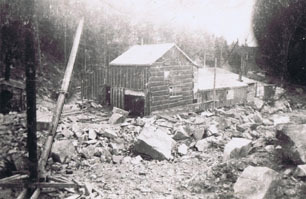 When the steam whistle blew at 8 a.m., a brigade of men began to cut away at rock with hammer and chisel. A young lad employed to carry around a bucket of water and one ladle was the closest thing these men ever got to a coffee break. Nevertheless some travelled from neighbouring counties to get the work. They lived in tents or hastily-made shacks built by the quarry. A cookhouse sometime bunked as many as 18. Jessie Delorey provided "three squares" for the hard-working men in those days. 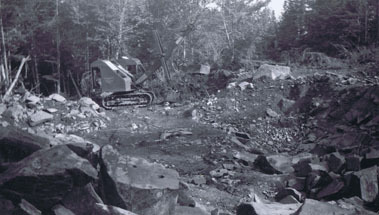 In Wildred's time, the "Scotch rock" was extracted exclusively from the local quarry but today the Arsenaults work with rock from as far away as Africa. The longevity of Arsenault Monuments, the ongoing creation of Wilfred's sons, Phil, Joe and grandson Glenn, give testimony to its growth.